"3LA1, V-1965" by Timothy K. Perttula and Robert Z. Selden Jr. CONTEXT INFORMATION: From a plowed-out grave excavated by Dan Jenkins in 1939. Associated with vessels V-1964 to 1969. DECORATION: The lip is notched, while the tall rim has four widely-spaced horizontal engraved lines. 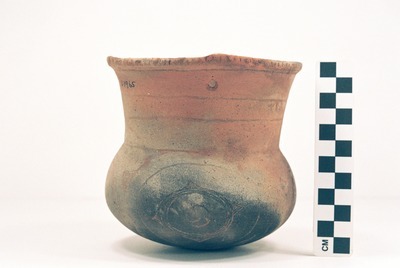 The vessel body has an engraved motif repeated four times around the vessel. The motif consists of a near square zone outlined by four cross-hatched triangles, two of which have negative ovals within them. Within this engraved zone are two circles, the innermost defined by a series of fine engraved lines and four engraved spurs. Within this central spurred circle is a small engraved circle with two hooked engraved lines. Handy Engraved deep bowl (5425-650) from the Battle Place.